The HitchSafe slides into your current standard 2" Hitch Receiver on your Ute, Car or Van and is secured inside the Receiver Hitch via two bolt retaining bars inside the HitchSafe. 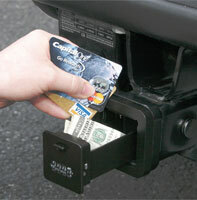 The Hitch Receiver itself is a solid steel vault that combined with the HitchSafe provides the most secure location on your vehicle to store spare keys, credit cards, cash and driver's license!! Do not purchase this product if you have a genuine Nissan towbar. For some reason, the clever clogs at Nissan decided to go with a hitch receiver profile that has very rounded corners instead of a 'standard' one like a Hayman Reese. The end result is that this awesome little item will not go into a genuine Nissan towbar hitch receiver. Tis a shame as it looks like an awesome product - I just can't outlay $700 to swap out my genuine Nissan towbar for a more 'standard' profile one.